April spirits launches to date include new pink gins - from the UK and overseas - and also limited-edition seasonal variants of gin and vodka. The producer of Boadicea Gin has created a pink expression, Rosa, which includes an infusion of cherry and peach. Boadicea is created in East Anglia by Matt and Steph Brown, co-founders of Founding Drinks. And another UK-based producer introducing a pink offering is Adnams under its Copper House brand. The producer is adding Copper House Pink Gin in time for the summer, which is its original dry gin blended with a dash of raspberry. Head distiller, John McCarthy, said" :Our Copper House Dry Gin is made from grain to glass using East Anglian Malted barley which is first brewed into an unhopped beer before being distilled to a vodka. We then redistil this vodka with six botanicals to create our award-winning Dry Gin. I then add raspberry to create those amazingly vibrant fruity aromas while still maintaining the character of a true gin." Overseas producers are also looking at pink options. Another one tapping into pink is Manchester-based importer Morgenrot with the Macronesian ‘Eternal Spring’ Strawberry Gin from the Canary Islands. Meanwhile, Bombay Sapphire hopes to tap into the interest in seasonal variants and so it has created a limited-edition gin inspired by the English countryside for the summer months. Bombay Sapphire Limited Edition: English Estate is said to be the first in a series of limited-edition product innovations from the brand in the years ahead. The variant, created by the Master of Botanicals and the Master Distiller at the brand’s home in Laverstoke Mill in Hamphire, UK, is made using the classic Bombay Sapphire gin infused with three new botanicals: Pennyroyal mint, Rosehip and toasted hazelnut. The launch will be supported by a global launch campaign and the gin will be available for 12 months only. A signature cocktail sees the new variant paired with Fever-Tree ginger ale and cloudy apple juice, served with lemon, apple and thyme, over ice. 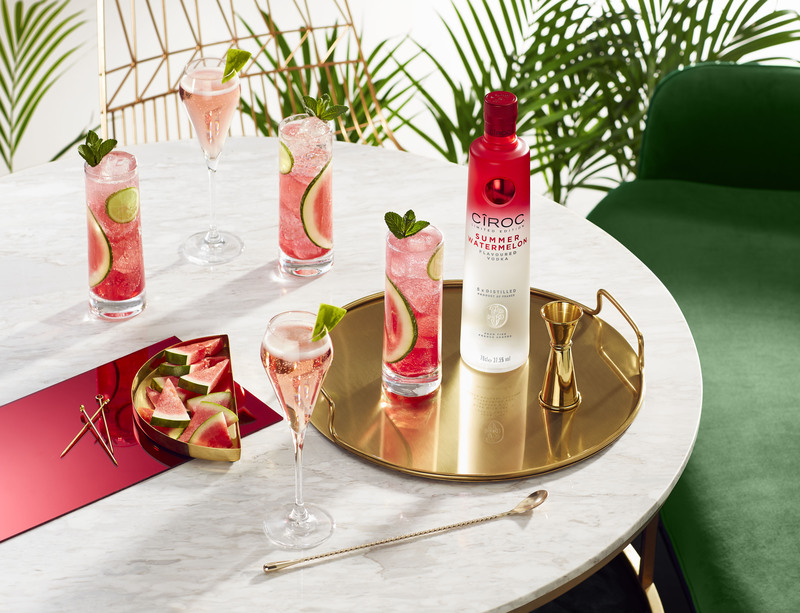 Outside of gin, Diageo Reserve is also introducing a summer spirit option under its Ciroc vodka brand. Summer Watermelon, which is presented in a frosted red and white bottle, has been infused with natural watermelon, which the company said is “one of 2019’s trending flavours”. Bottles will be priced £39. There is also a signature serve: Ciroc Summer Watermelon Spritz. Rich Larkin, head of Diageo Reserve GB, said: “White spirits continue to lead the way when it comes to seasonal drinks and we are constantly innovative and researching to bring the freshest new flavours to the on and off-trade.